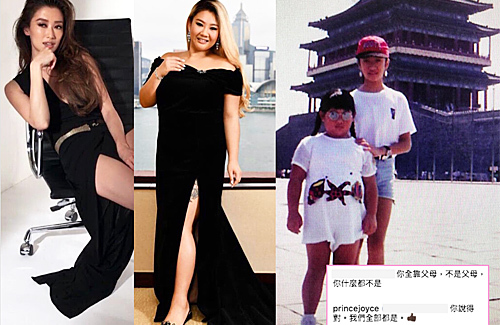 Growing up in Canada together, Joyce Cheng (鄭欣宜) and Jennifer Tse (謝婷婷) have been friends since childhood. Although their careers and lives have taken them in different directions, the pair maintained their friendship through the years. Despite the tender post, it still solicited some negative comments from unpleasant netizens. One person wrote, “It’s all thanks to your parents. Without your parents, you are nothing!” This is not the first time Joyce has dealt with public criticism. Facing such malicious comments, Joyce continued to hold her composure and firmly, but thoughtfully responded, “You are right. This applies to all of us.” Good friend, Louis Cheung (張繼聰), praised Joyce for her emotional intelligence. Disgraceful, what a hurtful comment to make to someone. She’s paying a compliment to Jennifer and admitted that she has not turned into a swan like Jennifer. Why the cruel comment? Why the negativity? Its not her fault she is the daughter of 2 well known celebrities. However, Joyce appears not to have taken advantage and has never come across as rich, spoilt or entitled. She probably has alot of money and can pay for cosmetic surgery to look different. But she has chosen to do the best with what she has, which is great for her. It is easy to hurt and condemn virtually. No responsibility involved. Joyce is the epitome of graace in a storm. She has faced so many cruel remarks before but continues to not lash out in a negative mmm anner. It takes sophistication and grace to do that. Joyce is not to be blamed because her parents were well known and wealthy. Some netizens needs to attend a school for common sense and wisdom. They need to come forward, instead of staying backwards, blind and ignorant. Joyce has gone through a lot, and in total agreement with everyone above. She is “the epitome of grace, in a storm”. Beautiful young modern lady, whether it is cool acceptance of a less than perfect Asian ideal of a figure … and being not delusional, bitter or biatchy of those around her. She is … as her song goes: “女神”. Seen her in Vancouver as a schoolgirl in her Crofton House school uniform a few times, with her mom. My heart went out to her – during her mom’s roller coaster with cancer. And later, when both her Grandma and Mom (both the pillars in her life) died one after the other, in mere months or weeks. It was ALOT for a young person to shoulder and deal with, alone. Cruel life blows, to a girl who was just barely 19 or 20 then. With a dad remaining, who was not much of a dad all her life. And yet she HAS survived; and risen to be such a cool young woman. Someone who embraces WHO she is too – imperfections, flaws et al … with such self-awareness and graceful graciousness. SHAME on the negative commenters. @nomad822 beautifully said. I met her and her mom. Her mom had a positive, bubbly aura which she passed onto Joyce. I felt for Joyce when Lydia died, and I wished the beautiful, humble caring lady who was Lydia had lived, but at least we can take consolation in the fact that she is out of the horrendous pain brought on by cancer. Joyce has inherited her mom’s poise, bubbly personality and humbleness. I don’t think Joyce realizes she is a celebrity who inherited her mother’s wealth. She is that humble and down to earth. A lot in the industry can learn a lesson in humility from Joyce. As for her looks, we are all of different features and size. She carries herself so well, so elegantly and humbly and to me, Joyce is beautiful.I am glad she accepts herself for who she is. Any man worth his salt who is fortunate to have Joyce should be counting his lucky stars. If she was in most countries in Europe, or the caibbean, men would be falling over themselvesfor a woman with meat on her bones, not the pale cadaver waifs in the industry who starve to look like Ms Skeletar. Beautifully said Nomad22. what a nasty comment, kudos for holding it together for joyce.